From cash incentives and lifetime discounts to free trips—she totally deserves it all! After winning the silver medal in the women’s 53-kg category in weightlifting at the 2016 Rio Olympics, Hidilyn Diaz got a lot of other perks for bringing honor to the country. For starters, Diaz, who is a member of the Philippine Air Force (PAF), was promoted from Airwoman 2nd Class to Airwoman 1st Class. Then, by virtue of Republic Act No. 10699 or the National Athletes and Coaches Benefits and Incentives Act—which expands the coverage of incentives—Diaz received P5 million from the government. "Fortunately for Diaz, RA 10699 supplanted the old RA 9064—the Sports Benefits and Incentives Act of 2001—where the previous amount for silver medalist winners was only P2.5 million," pointed out SPIN.ph. President Rodrigo Duterte gave her an additional P2 million. Sen. Manny Pacquiao likewise gave her an undisclosed amount from his private funds. 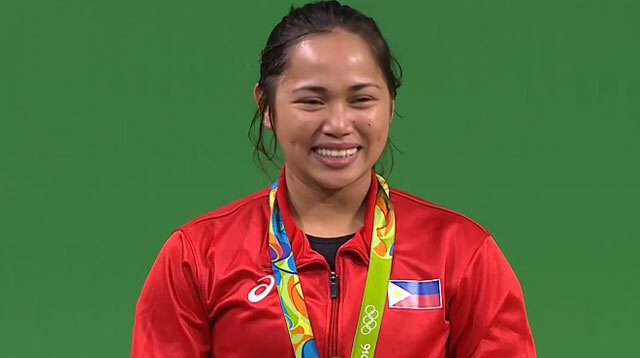 The Philippine Star pointed out that Diaz is actually "the first Olympic medalist to benefit from RA 10699, which also provides scholarship and retirement benefits equivalent to 25 percent of all her winnings throughout her career." In a Manila Bulletin feature, Sen. Ralph Recto went on to explain that the law also grants Diaz "a 20 percent discount in all establishments—transportation services, hotels, restaurants, and recreation centers, [when] purchasing medicine and sports equipment, [and when she avails of] admission fees [to] theaters and concert halls, circuses, carnivals, and other similar places." Moreover, Diaz will get free medical and dental consultations from government hospitals and similar establishments anywhere in the country, coverage in the National Health Insurance Program of PhilHealth through the Philippine Sports Commission, and benefit from a comprehensive social security program to be formulated by the Social Security System (SSS). She will also be prioritized in national housing programs. AirAsia is also giving Diaz the privilege of flying free to any of their more than 120 destinations for five years. ABS-CBN News noted that the airline company had given free flights to ASEAN athletes who won medals in the Rio Olympics. Despite all the perks that she's getting, Diaz has not forgotten to raise the plight of Filipino athletes who lack funding. In a press conference after her PAF promotion, she revealed, "So 'yung ibang Olympians, imbis na looking forward sila sa susunod na Olympics, hindi na lang. Kasi sa liit ng allowance nila, kulang pa para sa pagkain nila (For other Olympians, instead of looking forward to the Olympics, they just give it up. It's because the allowance they get is so meager that it's not even enough for their food)."